Trying to buy a gift for someone is not always the easiest thing to do, and you can often spend hours on the internet trying to find the perfect gift. 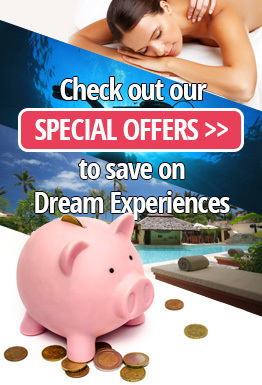 At Dreamdays our website is designed for you to easily find the right gift, and with hundreds of special offers you will get a great bargain as well. If you are stuck for gift ideas you can begin by simply searching by location to find out what is going on in the area you live in or the person you are buying for. There is likely to be a lot of choice, so you can then filter your results by looking in different categories. We have over 4000 experience days which include hotel breaks, spa days, driving experiences and eating out vouchers and we even offer ideas for special occasions such as birthdays and Christmas. Treat someone special today. Dreamdays.co.uk is the sister of the driving experience powerhouse, Trackdays.co.uk and is managed and run by the same team. With 14 years in the industry the customer service team know how to look after customers and make sure you get non-biased advice on your gift as well as receiving your voucher in time. Customer have rated our service team 4/5 stars and 8.7/10 on Trustpilot, with new 5 star rating arriving every day.